Can’t get enough of the recently concluded The Voice Kids grand champion? This is your chance to watch her again and this time you will have a wider view of her life as a kid. 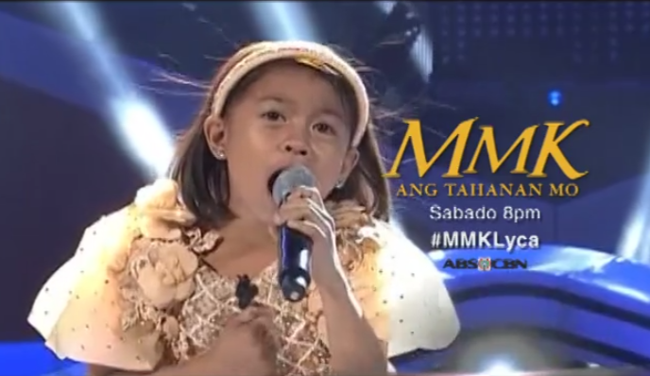 Lyca Gairanod’s story will be featured in Maalaala Mo Kaya this Saturday, 8 PM at ABS-CBN. Because of this episode of MMK, we will be able to dig into the history of Lyca and how things happened in order for her to be where she is right now. Lyca was coach Sarah’s trainee on The Voice Kids and competed with three others, namely Juan Karlos, Darlene and Darren. And because of her sweet and powerful voice, she emerged victorious over the three opponents, one from Coach Bamboo, one from Coach Lea and the other one came from Coach Sarah who happened to be her coach also. MMK’s official account uploaded the trailer of the episode on Facebook that made a lot of fans excited about it. Lyca’s life is interesting since she came from a family of scavengers. To give you a glimpse of it, Lyca at an early age knew exactly how hard it is to survive with just a small amount of money earned by her parents not to mention the fact that they do not have their own house. MMK’s episode this Saturday is worth watching since it gives hope to those who are hopeless, especially to those who have already forgotten their dreams due to poverty and other external factors. Lyca has proven something at an early age and she should be emulated. The thread of comments on the video uploaded in Facebook shows the reactions of Lyca’s fans who supported her during the text voting to be able to get to the top. This Saturday, do not miss the chance to know Lyca more on MMK.